Now presented to the English reader for the first time are the complete memoirs of the “national preacher” Zvi Hirsch Masliansky, first published in Yiddish in 1924 and in Hebrew in 1929. The book is an important historical source describing Jewish life in the late 19th and early 20th centuries on three continents. It leads the reader from the author’s childhood in the town of Slutsk, Lithuania, where he was born in 1856, through his education and early working career as a Hebrew teacher, to his involvement in the Hibbat Zion national movement from its inception in 1881, and especially to his travels as itinerant preacher on its behalf through the Jewish centers of Czarist Russia in the early 1890s. The second focus of the book is on Masliansky’s activity in the American Jewish community after his arrival in New York City in 1895. As a writer, public worker and first and foremost as a much adored public speaker he played a pivotal role in the adaptation of the Jewish immigrants from Eastern Europe to American life, while encouraging them to preserve their national tradition. The final part of the book describes his visit to the Land of Israel he had always longed for, during the formative stage of the building of the “Jewish national home” under the British mandate after World War One. an “Afterword” - the childhood memoirs of Zvi Hirsch Masliansky’s grandsons, Jimmy and Marshall Weinberg. The book also includes some photographs, most of them shown on this website's Pictures page. 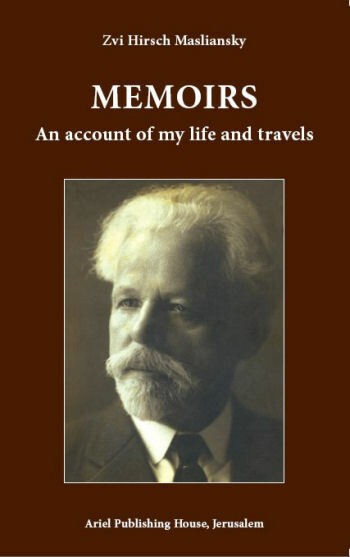 Both the Yiddish and the Hebrew versions of the memoirs were written by Zvi Hirsch Masliansky himself and based on his Hebrew itinerant diaries. This English translation was born on a pleasant July day in 2006, when four of the descendants of Zvi Hirsch Masliansky gathered for lunch in New York City. They were his grandsons, Jimmy and Marshall Weinberg of New York, and his great granddaughters Zviah Nardi and Meira Nardi Bossem of Jerusalem, Israel. The conversation turned to the Memoirs of their progenitor that have become inaccessible to the majority of his descendants, being English-speaking and living in America. The problem had already been addressed some 30 years earlier by Masliansky’s son-in-law, Dr. Harold Weinberg, father of two of the grandchildren present, who had commissioned an English translation of the Memoirs from another of Masliansky’s grandsons – Isaac Schwartz, an accomplished Hebrew-English translator of both prose and poetry. The Weinbergs had in their possession a typewritten version of this translation, encompassing Chapters 1 - 29. The four grandchildren immediately decided to bring this work to completion, a task entrusted to Masliansky’s great granddaughter Zviah Nardi, a trained historian and professional translator, and to produce an English version of the book. Some of other family members who contributed to this endeavor were Rebecca Schwartz Greene, who served as proofreader; Naomi Schwartz Pasachoff, who was our “trigger”; and Susan Turberg Resnik, who provided useful advice and comments as did Joel Weinberg. In addition to the sentimental value for family and friends, we feel that accessibility of the book to the American Jewish reader is important as a historical source both for the formative years of the absorption of the mass immigration from Eastern Europe in America and for the pre-Herzlian Zionist Movement in Russia (Hibbat Zion) about which there are few sources in English. Though it is not an academic publication the translators have made the utmost effort to make it “reader friendly” by clarifying Jewish terms briefly in square parentheses throughout the text and supplying clues beyond the reach of the average internet user to issues and people. A special category of footnotes, the “Family Notes” were added following the correspondence among family members during the progress of the work, we believe they are not devoid of interest to the general reader as well. We wish to note that chapters 33 – 48 of the book, dealing with Masliansky’s early years in America, have already been translated into English by Dr. Gary Philip Zola as an appendix to his thesis: The People’s Preacher; a Study of the Life and Writings of Zvi Hirsch Masliansky (1856 – 1943), Hebrew Union College – Jewish Institute of Religion, 1982, pp. 110-209, which also includes extensive footnotes for these chapters (pp. 210 – 248). However, ours is a new translation not based on Dr. Zola’s work. Why is this page on a Cleveland Jewish History website? The first pages on this website were about Cleveland's most famous Jewish citizen: Abba Hillel Silver (1893-1963), rabbi of The Temple - Tifereth Israel and a life-long Zionist. In the 1940s Rabbi Silver's awesome oratorical skills helped him lead the American side of the campaign to establish the State of Israel. "Abe" Silver grew up on New York's Lower East Side, at a time when Reverend Zvi Hirsch Masliansky would speak each week at the Educational Alliance. In Silver's unpublished memoirs we learn that the great preacher had taken a liking to him and would let him sit on the side of the platform, out of the audience's view. Silver remembered those moving speeches and wrote "After these many years I can still taste the sweet honey of his words." Thus, this site is a fine place to host these new pages about Zvi Hirsch Masliansky - the man who was Abba Hillel Silver's oratorical inspiration.